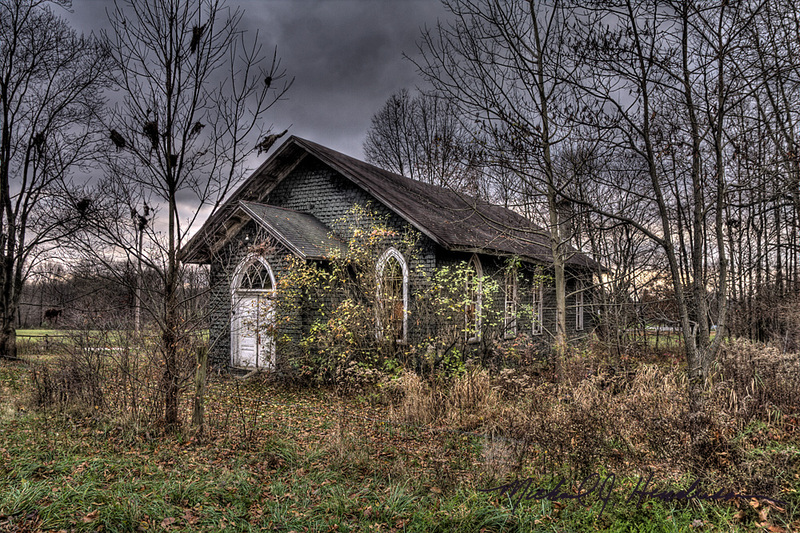 Sitting at the corner of Shreve Road and Turkey Farm Road in Venango County, Pennsylvania, this old abandoned church lies in state. Thanks to the contributions of Rev. John Miner Critchlow, construction of the church was completed in 1891, which resulted in it being named “Critchlow Memorial Church.” Originally used by the Free Methodist congregation, the old building today is remembered simply as the Jamison’s Corners Church. The church is located at N 41° 34.155′ W 79° 40.606′. Here is the church in fall of 2012. Here is the church in January, 2013. Notice the earthen ramp and garage door that was added in recent years. The old building has been used for farm storage. Thanks to Penny at the Venango County Historical Society for providing historical info. This is my fav.. 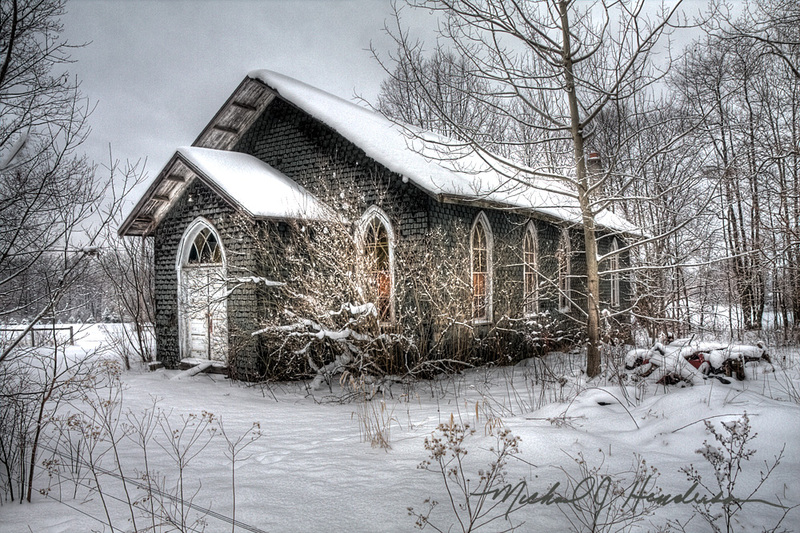 I want a copy of the one of the front of the church in winter for my wall.. How do get one…??? Hello Peggy, thank you for your support! All you need to do is click on the photo; that will take you to my online ordering site, where you’ll see a list of print size options to the right. I highly recommend the metallic Fuji Pearl paper as an option. Wonderful pictures and article! Because we lived a short distance away, we attended vacation Bible school there, even though we attended our own at Plumer United Presbyterian Church, because Mom felt we should support the effort of those who had a VBS in the area. Once Mom took us (Velma and myself who were probably 4 and 7 yrs. old) to a service. Because they worshiped differently from what we were used to, we began to laugh. That was a mistake! Mom immediately put a stop to that and when the services were over, we knew in no uncertain terms that we had better never act like that again. It was the last time we attended services there except for VBS. 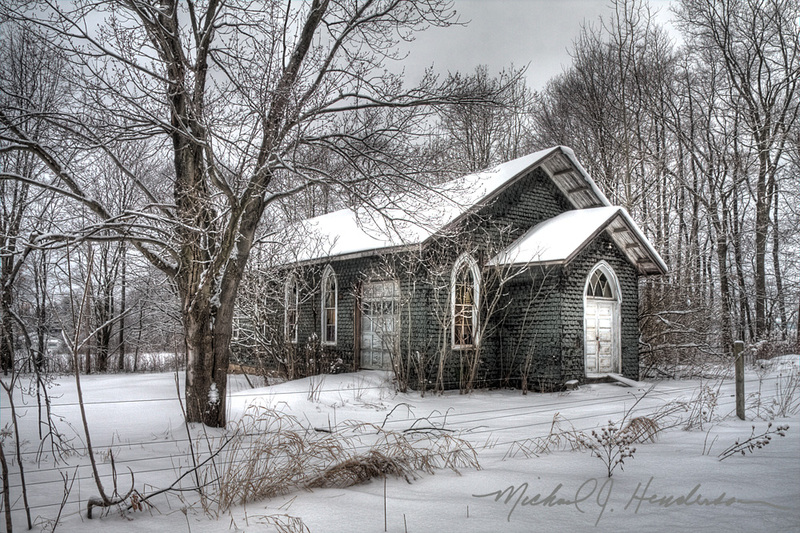 At one time it was well kept up and was a beautiful little country church. All through 1st through 12th grades we got on the school bus at that corner.